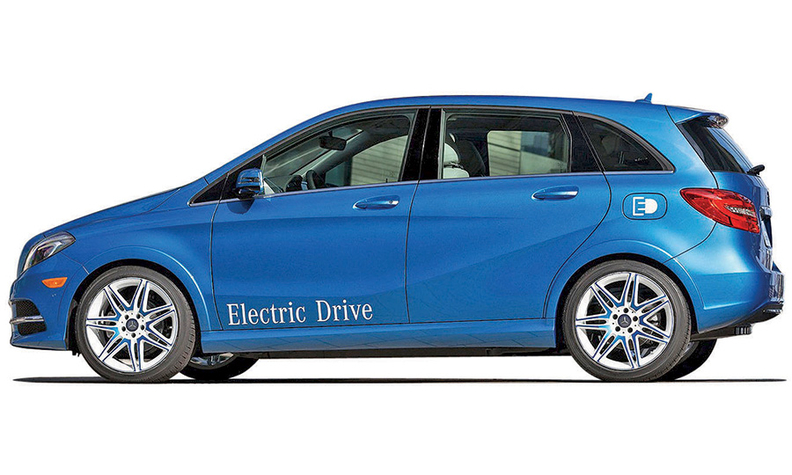 Mercedes-Benz B-class Electric Drive starts U.S. sales in 2014. The same front-wheel-drive platform that spawned Mercedes-Benz's new CLA four-door will be the basis of two more compacts next year: the B-class Electric Drive five-door and the GLA crossover. The CLA will be in showrooms next month, as will Mercedes' redesigned S-class sedan. Over the next two years, four new body styles derived from the S class will arrive, including a long-wheelbase range topper. Here is a summary of Mercedes' new product plans. CLA: The four-door sedan is the first front-wheel-drive Mercedes offered in the United States. The CLA45 AMG version with 355 hp and all-wheel drive goes on sale in November. A coupe derivative is possible after 2018, when Mercedes redesigns its fwd vehicle range. B class: The electric version of the new five-door sold in Europe will go on sale in the United States in early 2014. The B- class Electric Drive will be the only electric Mercedes available in the United States for the time being. The GLA crossover, on display at the Shanghai auto show, goes on sale in 2014. 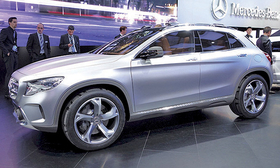 GLA: The compact crossover, a BMW X1 competitor, will hit showrooms in the fall of 2014. C class: The redesigned compact sedan will get slightly larger and will have a more luxurious interior when it arrives in September 2014. Variants will be added later, including a convertible, plug-in hybrid and 50-state clean diesel. Starting next year, the C-class sedan will be built in Tuscaloosa, Ala., for the United States. Also for the first time, the C class will be powered by a U.S.-built engine. Parent company Daimler and Nissan Motor Co. will produce four-cylinder Mercedes engines at Nissan's plant in Decherd, Tenn., starting in 2014. E class: The mid-sized sedan will be redesigned or re-engineered in 2015, followed by the coupe and convertible in 2016. CLS: The four-door coupelike sedan gets a freshening in 2014. S class: The redesigned flagship sedan goes on sale next month. Only the S550 long-wheelbase version is offered in the United States. The S550 hybrid sedan will debut at the Frankfurt auto show in September and will go on sale in the United States in early 2015. The S65 AMG high-performance model with a 5.5-liter engine will debut at the Los Angeles auto show in November and will turn up in showrooms next May. In addition to the sedan, four more S-class body styles are planned: a coupe, convertible, a coupelike sedan and a long-wheelbase car that will be priced between $200,000 and $250,000. The ultraluxury model will not go on sale before 2015. The two-door coupe will drop the CL name now used for the coupe derived from the S class. It will debut at the Frankfurt show and go on sale in fall 2014. The four-door convertible is expected in early 2015. SLK: The hardtop convertible will be freshened in 2014. SL: The roadster will be freshened in 2015. SLS AMG: The high-performance coupe and roadster may get a mild freshening in 2015. SLC AMG: A front-engine rwd sports car to compete with the Porsche 911 is expected in early 2015. It figures to have an AMG V-8 engine from Mercedes' high-performance arm. GLK: The crossover will be redesigned in 2016. There are reports that a coupe variant is in development. ML: The crossover will be freshened in 2014. A coupelike version called the MLC that would compete with BMW's X6 is expected in early 2015. G class: No changes are expected in the next several years for this military-style SUV. Sprinter: The freshened commercial vehicle goes on sale in September.